The new XTS drive system (eXtended Transport System) from BECKHOFF Automation offers PC-based control to provide modular and flexible solutions for the process and packaging industries. From the local acquisition of energy data to system-integrated measurement technology, for example for the measurement of temperature and pressure in laboratory automation, PC-based control from Beckhoff offers modular and flexible solutions. With the new XTS drive system, Beckhoff also offers the key to increasing the productivity of packaging machines with its fast control technology, which supports all communication standards. The new XTS transport system replaces classic mechanical systems by innovative mechatronics. The motor in the XTS is completely integrated together with power electronics and displacement measurement. One or more movers – wireless, mobile carrier modules – can be moved highly dynamically at up to 4 m/s on an almost arbitrary and flexible path configuration. XTS thus revolutionises drive technology in a compact design and makes completely new concepts for packaging machines possible. PC-based control technology offers a compact and powerful hardware platform for the process industry, especially in the pumping and control room. On account of open interfaces, communication into the process or field level is simple to realise via standardised software interfaces using a wireless or fieldbus link. TwinCAT automation software supports the common telecontrol protocols or the standardised, secure exchange of data with OPC UA. 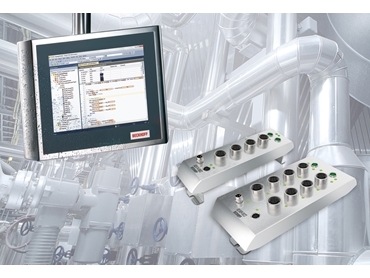 Using embedded PCs as a substitute for DCS (Distributed Control System), Beckhoff offers scalable PC technology in a miniature format for universal use, both as a decentralised controller and in the field of measurement technology. The directly connectable Bus Terminals support the connection of all common sensors and actuators for the precise acquisition of all process parameters in the chemical or process industry, such as for temperature and pressure. Beckhoff offers a complete control system in a stainless steel finish, ranging from the panel PC and I/O modules with IP 69K protection to the ‘Hygienic Design’ servomotor for areas of application with strict hygienic requirements. EtherCAT offers technological strengths such as flexible topology possibilities, integration of subordinated bus systems and optional redundant wiring for high system availability in process automation. High-end measuring technology can be integrated directly into the standard. TwinSAFE, the safety solution from Beckhoff, guarantees secure processing of data for applications in the process industry, allowing critical process units such as gas mixers to be safely controlled.